Submitted by Taps Coogan on the 1st of February 2019 to The Sounding Line. Enjoy The Sounding Line? Click hereto subscribe. Decades of a GDP-inflating construction boom has led China to a state of extreme infrastructure and housing overcapacity. In a country with a median income of less than $12,500, a stunning 70% of all homes sold in China in Q1 2018 were second or third homes and nearly a quarter of all homes are sitting empty. Nonetheless, China’s construction boom marches forward. 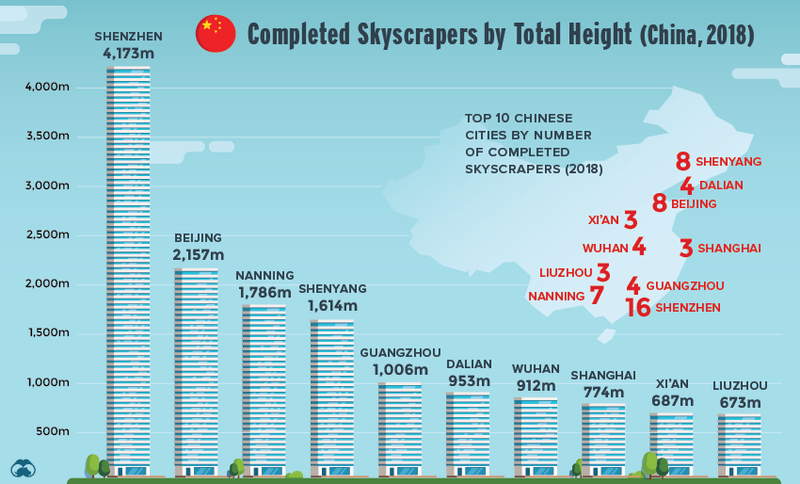 The following chart, from Visual Capitalist, shows that China built a mind boggling 89 skyscrapers in 2018 (buildings over 200 meters tall), 17% more than in 2017 despite a sharp slowdown in its economy. That is more than the entire stock of all of the skyscrapers in New York City and more than twice the number of skyscrapers built by the US, UAE, Malaysia, and Indonesia in 2018 combined. As the following chart shows, Shenzhen was the undisputed leader for new skyscrapers in 2018, followed by Beijing and Nanning. 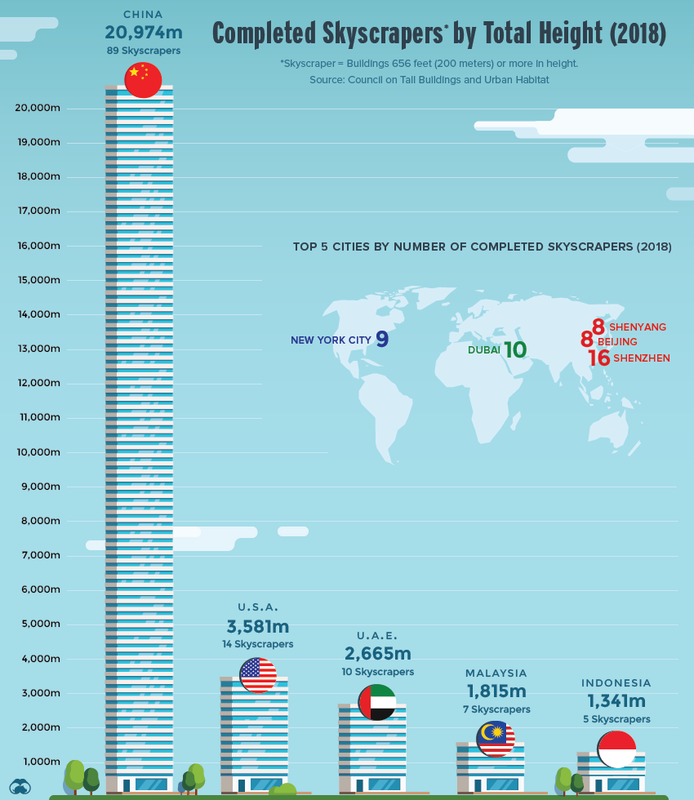 While the US lags far behind China, skyscraper construction has picked up significantly in the past few years. The US built 14 skyscrapers in 2018 compared to ten in 2017, with New York City now witnessing the one of the biggest building booms in its history. Nonetheless, in just three years from 2011 and 2013, China used more concrete than the US used in the entire 20th century. Yet, as Jim Chanos has often noted, the problem with using construction projects to boost GDP growth is that once they are completed, you have to build something even bigger to keep showing the illusion of growth. With China’s economy now slowing to its lowest levels in 30 years, will its central planners double down on yet more construction to try and avoid the the implosion of the most leveraged financial bubble in modern history? These guys are interesting . ADVChina on youtube .